Today, the New York Philharmonic announced the passing of Music Director Emeritus, Kurt Masur. In the early 1990s, I had the privilege of performing under his hands as a student at Mannes College of Music and The Juilliard School. Later, I worked as a Teaching Artist in the School Partnership Program (founded by Kurt Masur and the New York Philharmonic), and I regularly gave pre-concert workshops and lectures for his performances. From these perspectives, I wish to express thanks and to highlight some of Masur’s many contributions. Thank you for some of the finest performances I have ever heard. Especially, thank you for bringing Yevgeny Yevtushenko to perform an electrifying poetry recital before you performed Dmitri Shostakovich’s Symphony No. 13 in Bb minor, “Babi Yar.” with the New York Philharmonic. After such a symphonic apotheosis of Yevtushenko’s poetry, a thirteen-minute standing ovation didn’t seem long enough. Our world badly needs palpable artworks that directly challenge governments to confront racism and genocide. Thank you for repeatedly demonstrating how music and musicians can bring peace, healing, and unity in troubled times. Thank you for new music. Bless you for commissioning Sofia Gubaidulina to compose Two Paths. You knew our world needed phenomenally expressive double viola concerto. Moreover, you knew what the New York Philharmonic’s virtuosic viola principals, Cynthia Phelps and Rebecca Young could do. 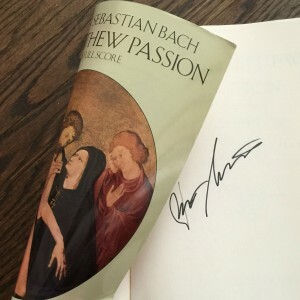 Kurt Masur refused to take a bow after his 2008 New York Philharmonic performances of St. Matthew’s Passion, but he did sign the score I used to prepare the pre-concert talks. Maestro, following your 2008 performances of J. S. Bach’s St. Matthew’s Passion, you wouldn’t take a bow or even step back up to the podium. Instead, you held the score high above the platform, and offered the glory to Bach and to God. Whether you were rehearsing students or professionals, you gave historical context, musical insights, and explanations of tradition. Thank you for singing, gesticulating, and cajoling until we all got it. Though I didn’t even play it, I still can hear you singing the viola solo from Kodály’s Háry János Suite. Thank you for Bruckner and Mendelssohn, too. Thank you for bringing out Anton Bruckner’s spirituality and his quintessentially Austrian folk influences. Your elegance and depth helped me to understand his symphonies for the first time. You did the same for masterworks of Felix Mendelssohn. Thank you for celebrating and conducting the music of American composers, especially Duke Ellington. You introduced so many young musicians to Three Black Kings; Black, Brown, and Beige; and A Tone Parallel to Harlem. To help us understand how to articulate jazzy syncopations, you exhorted us to listen to vintage big band recordings. Listening helped tremendously. Thank you for music education. You said that every public school elementary school student should graduate with a diploma in one hand and a recorder in the other. Some of us questioned the idea at first. However, recorders proved effective tools for performing, improvising, composing, and internalizing musical themes. You should have seen students walking down Harlem streets playing “Ode to Joy” of their own freewill while wearing their caps and gowns. It still happens, over twenty years later.